In the new movie "School of Rock," the multi-talented Jack Black plays a struggling musician who scams his way into a substitute teacher position at a prestigious prep school, where he eventually turns his reserved fifth grade class into a wild rock 'n' roll band. Black tells The Early Show co-anchor Harry Smith the message of the film is mostly for parents. He says, "It's saying come on, you know what? The kids, if they want to explore some artistic sides, they've got to let them or else you're cheating them of some magic." For the kids, he says the film is a "fun roller coaster ride." His young co-star Joey Gaydoas, who plays lead guitar player Zack, adds, "A long way to the top if you want to ride." The ride is getting rave reviews. USA Today is calling Black the 'Music Man' for the rock 'n' roll generation. And the New York Times calls the film, "funny-for-kids-of-all ages delight that should catapult Mr. Black straight to the top of the A list of Hollywood funnymen," which incited plenty of high fives between Black and young co-stars Gaydoas and Aleisha Allen (backup singer Alicia). Black says, "I like the 'Music Man' of rock. The rock man. Rockman!" To Gaydoas and Allen, he is uncle Jack. Gaydoas says, "At first, it was like, 'Oh, my God, that's Jack Black, and now he's just like a good friend." Both Gaydoas and Allen say it was a blast to work with Black. Allen says she learned "how to rock out and be professional at the same time, which is a great value in this acting business." As for Black's character, the actor, singer, songwriter and guitarist says he shares a lot of similarities with Dewey Finn. Black has his own band, Tenacious D, and Finn is a musician in a band called No Vacancy. But in the movie, Dewey is kicked out of his band. Black explains that while rock 'n' roll is a significant part of his life, music is the only thing in Dewey's life. 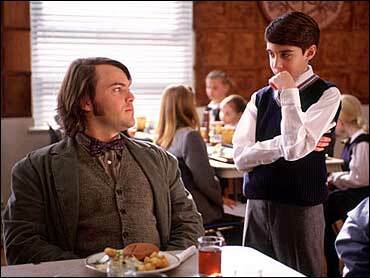 Dewey is forced to find a job when threatened with eviction by his friend's girlfriend, so he pretends to be a teacher to land the job as a substitute. When he discovers the uptight kids have musical talent, Dewey help mold them into a electrifying rock 'n' roll band. Black says, "Like so many of the frustrated rockers of the world, he's had to put his dreams on hold so as to pay the rent. The legendary 'rent is way past due.'" Costar and screenwriter Mike White (Ned) wrote "School of Rock" specifically for Black, which he says captures the funnyman's unique personality. Black attributes the great experience he had filming to the director and the cast. "Richard Linklater, a great director," he says. "He has a method of rehearsing and getting everything going in a perfect machine and those kids are so awesome. He picked great kids. They say 90 percent of directing is picking people, or casting if you want to get technical." In 1992, Black made his feature film debut in Tim Robbins's "Bob Roberts"
In 2000, Black gained attention as a loud, opinionated record store clerk in "High Fidelity"
In 2001, Black co-starred with Jason Biggs in "Saving Silverman"
In 2002, the actor co-starred with Colin Hanks in "Orange County"